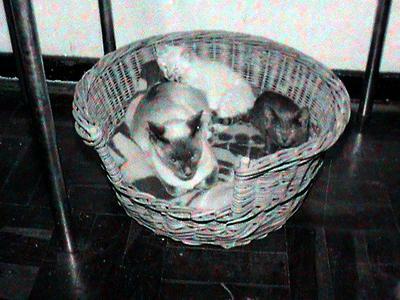 When teens, our Seal-point Siamese "Symes" popped 2 kittens, BAF and Charka. 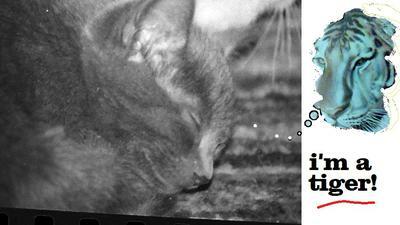 Baffy was gentle, ladylike, playing soft-paw, loving cuddles/strokes. Small brother Charka was a confirmed hooligan. Long-suffering mother Symes would tolerate pouncing on her, attempted nelson-lock and killing her tail. Baffy would first play then hide behind "Mom". 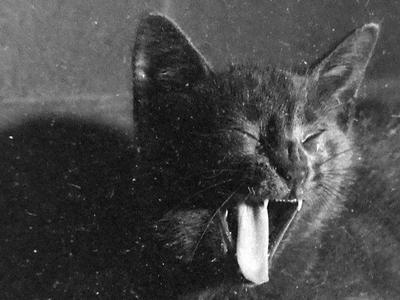 The small bundle of energetic mischief got nicknamed “Little Hell”. The beady-eyed Lil'hell, had claws…Small sharp claws…And teeth. When my (then girlfriend) first came to visit the new arrival, she tried to stroke him gently. Ha. As she extended her hand, he went into ‘body-waggle’ mode, small tail flicking. My dad remarked “Uh-oh”.. As Flo's hand got near, he launched, hugging her arm with all his might, and “mock-biting” her hand. My sister's soft velvet slippers were discovered. Attack!! She lifted her leg, kitten still wrapped firmly around slipper, “eating” it.